Every so often there is a beauty product launched, where, upon first use you just know that it will become a long term favourite. 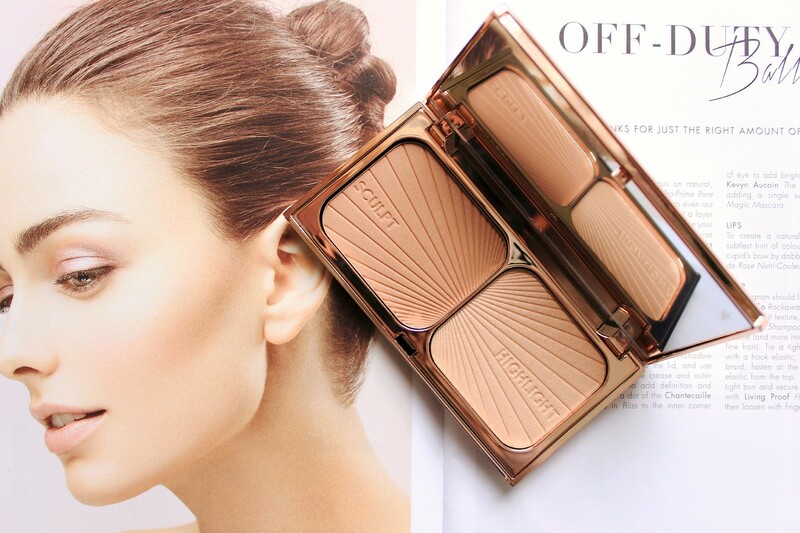 One such product for me is the Charlotte Tilbury Filmstar Bronze and Glow face, sculpt and highlight kit. When I first discovered Charlotte Tilbury back in 2014 I was completely taken back by the beautiful rose gold packaging, sultry looks and the sheer array of beauty on offer; the brand truly is a beauty bloggers dream. One of the first products I first purchased was Filmstar Bronze and Glow and to this day I have not once regretted spending those hard earned pennies. At a price of £49 this was without a doubt the most expensive product I had purchased at the time, in fact I still remember paying for it and having to pinch myself that I was making such a pricey purchase. Even now three years on, I rarely spend that amount of money on one single product, it is a big deal which needs to be justified not just by the hype surrounding it but by also how good the product is and whether you would, come the time, repurchase. First and foremost, the packaging of this is incredibly beautiful and elegant. It is glamorous yet still sophisticated and feminine. It also comes with a nice handy mirror too which of course is always an added bonus with any make up product. Filmstar Bronze and Glow contains both a bronzer and highlighter which I believe was somewhat promoted as being a product which you could use to create a contour and then of course highlight. Despite how much I adore this product I do think that it would be wrong of me to say that you can use it as contour, because in my personal opinion the bronzer is simply too warm for that, particularly on my fair skin. Warmer complexions may get away with using this as a contour, however for pale folk like myself you really do want to stick to using the bronzer in order to create a sun kissed glow to the skin. The bronzer is without a doubt beautiful, however for me the product really stands out when the highlighter is considered; it is simply gorgeous. The champagne golden pigments on the skin look utterly beautiful without it being too overpowering and unnatural. If I am honest if this highlight was available on its own then I would be incredibly thrilled, it really is right up there in terms of longevity, quality, pigmentation and shade. Both products are finely milled and are easy to apply and blend onto the skin, making this quite the perfect combination. Upon original release there was only one shade of this available which of course was rather limiting, however last year if I remember correctly there was a darker shade of this launched which of course made it more appealing to a wider range of people. I do still think that the shade range could be expanded though if I am completely honest as two ranges of light to medium and medium to dark is still not a true representation of the skin tones that are out there. Despite that one criticism, I still highly commend and indeed recommend this product. It is still today one of the nicest products I own and I cherish it dearly. Would I repurchase come the time? Absolutely!